Titanium dioxide is a naturally-occurring mineral compound and one of the world’s most important and widely used substances. Its unique optic properties and bright whiteness lend pigmentation and brilliance to everything from paint and cosmetics to candy and medicines. Extensive research shows no correlation between titanium dioxide and human cancer. Even in nanoparticulate form, titanium dioxide use is safe. Despite significant evidence showing titanium dioxide poses no risk to human health, the French Agency for Food, Environmental and Occupational Health and Safety (Anses) recently proposed classifying titanium dioxide as a Category 1b carcinogen, which could significantly restrict its use. 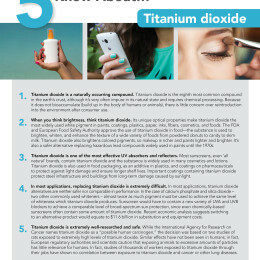 You can learn more about titanium dioxide safety and the consequences of eliminating its use in our research brief: 5 Things to Know about Titanium Dioxide.